Recognized as the essence of life and known as one of nature’s most powerful forces, the sun stands as a symbol of life, nature, growth, and change. Without the sun, we wouldn’t know the beauty of the mornings, the magnificence of a sunrise, as well as a sunset, the variety of the seasons, and the captivating cotton candy skies. Without the sun, the world would be trapped in complete darkness, as the moon wouldn’t exist without it. Can you even imagine days and nights being merged into an endless night, without a single ray of sun, and the magical moonlight? Sun stands for a birth of a new day, a new beginning, a new phase. With every sunrise new day commences and opens up many doors of endless opportunities. Every time the sun goes up, each and every one of us has the chance to start over, start creating a completely new reality and open up to the world. The morning is wiser than the evening, and it isn’t just a phrase: once the sun comes up you are able to think clearer, set the records straight, take a deep breath, and truly seize the day. The power of the sun has been known for centuries. In ancient times, many nations celebrated the sun in their religions and rituals, and various different philosophies revolve precisely around the significance of the sun. While people don’t necessarily bow to the sun anymore, we certainly do acknowledge its importance for our health, well-being, daily functioning, as well as mood, motivation, and drive. Just comparing your mood on a sunny day on one hand, and a rainy, gloomy day on the other, is more than enough to appreciate the sun, although its immense value and countless benefits stretch far beyond the obvious. Without the sun, the moon would be just a rock we wouldn’t be able to recognize in the night sky. The sun and the moon represent a perfect union and an unbreakable bond. In life, every person is bound to find their own sun – a person who allows them to shine and reach their full potential. The sun is selflessly sharing its energy and light with the moon, and they seem to have made an eternal pact. 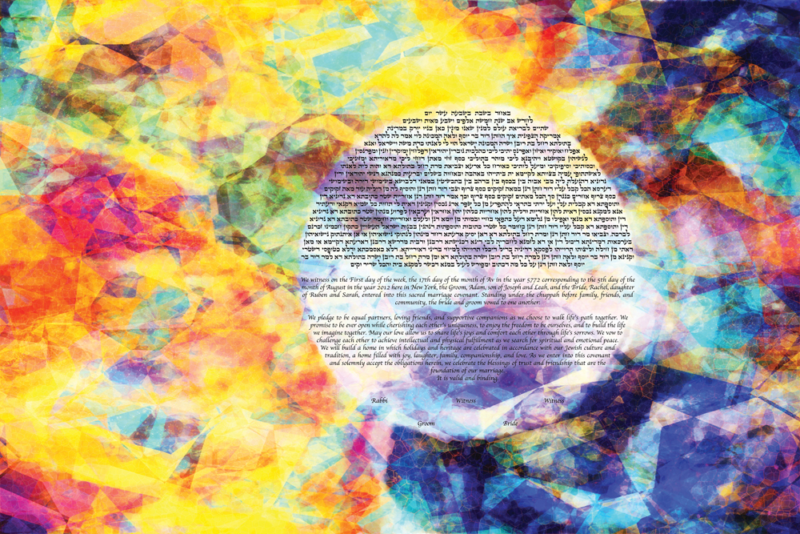 Sun ketubah can represent just that: people finding their sun and finally having someone brave enough to bring some light into their lives when they need it the most.